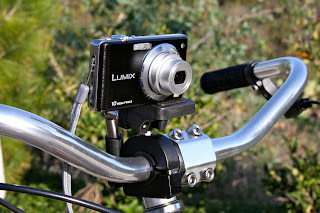 I thought I'd give my new Electra Camera Mount a little shakedown on my local mountain bike trail this morning. Although the unit is not designed for off-pavement use, as the product manager for the item, I should push the limits a bit and see if it would hold up the rigors and vibrations present when riding off road. Overall I'm pretty happy with the result. I have about ten minutes of footage and will review sometime over the weekend to find some good clips. This looks very promising how has it been working since this posting?